Excellent Poly supplies businesses with the packaging materials needed to keep product items in top condition while simultaneously sharing a marketing message with every customer the products reach. 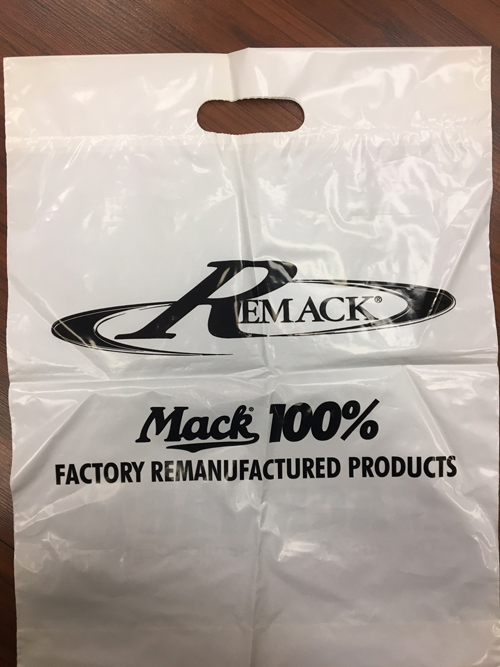 Our die cut handle bags serve this storage and marketing process efficiently for all types of businesses including retail stores, corporate businesses, municipalities, tourist industries, and schools. Die cut handle bags provide an easy to use, sturdier alternative to standard plastic bags. Die cut handle bags can be custom printed with the client’s choice of size and materials. This allows a large array of marketing options such as the inclusion of tag lines, location, logo and more. Bags can range from a minimum size of 5” wide x 7” long to a maximum of 30” wide x 52” long and come in ten different color options. These diverse options encourage our clients to be creative, producing efficient marketing towards their target audiences. To further our clients marketing benefit with die cut poly bags, a tear off coupon can be added to the bottom of the bag. The convenience of die cut poly bags allows for low cost, repeat advertising as these bags are often reused multiple times before being recycled or thrown out. The high quality of our polyethylene (PE) or Coextruded (Coex) bags also provides superior protection against tearing, ripping, and elemental exposure. To ensure the advanced quality of our die cut handle bags for carrying and storing heavier objects and merchandise such as clothing, books, containers, etc. they can be made with a fold over handle. Fold over die cut handle bags are reinforced at the top with an extra layer of film to provide additional strength to the handle area. This reinforcement provides extra durability to the upper portion of the bag. Additional die cut bag options include patch handles, which are rarely used but provide a less expensive alternative to the die cut handle. We also provide Staple Pak Die Cut handle bags which are grouped by a cardboard header at the top. The header holds multiple bags so that they can be ripped off one at a time.